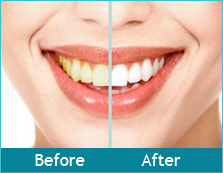 Teeth whitening is one of the simplest cosmetic procedures if done right. Doing it right means using a proper whitening agent (that is, a good hydrogen peroxide gel) and an appropriate whitening accelerator. The most practical accelerator is a LED lamp emitting cold blue light with a wavelength of around 465 nanometers. This wavelength of light is ideal for activating the hydrogen peroxide and accelerating the whitening process. The procedure is very simple. Hydrogen peroxide gel is applied to the teeth. A cold blue light is placed directly in front of the customer's exposed teeth and run for 15-20 minutes per treatment. Typically we perform 1 to 3 treatments on each customer during the same session, and the more treatments we perform the better results you obtain. A cosmetic teeth whitening treatment will NOT make the teeth pearly white. It will make them whiter. How much whiter? It really depends on a multitude of factors, including how stained the teeth were before the whitening, what kind of staining agent caused most of the coloration, how well the person's enamel reacts to peroxide and the number of treatments performed. It also depends on the kind of gel (carbamide vs. hydrogen peroxide), the concentration of the teeth whitening gel and the kind of application system that is used. Most people will get impressive results while a few will get less dramatic results, but 99% of people are very satisfied with the results they obtain with our system. Some people's teeth cannot really be whitened at all, such as those that were stained by the antibiotic tetracycline or fluorosis. Although there are significant differences among the teeth whitening lights available in the market, the most important factor is the gel. Hydrogen peroxide works much better than carbamide peroxide. 16% hydrogen peroxide is the strongest teeth bleaching gel you can use without the use of a gingival barrier. However, this gel is so strong (and therefore gives such good results), that it cannot be used with a mouth tray because with the mouth tray it gives too much gum irritation because some of the gel goes onto the gums. The only way to use this gel and avoid gum irritation is with our proprietary teeth whitening system. "Our system" refers to our Advanced Whitening Kit and procedure. Most companies in the teeth whitening industry use the "tray system". We used to only offer the tray system and still do to those who ask for it, but 95% of our customers are happier with the advanced kit. Our Advanced Kit uses a Cheek Retractor and an Applicator Pen with 16% hydrogen peroxide instead of a mouth tray and a syringe. The customer puts on the cheek retractor, and then, using a mirror, applies the gel directly to the teeth using a pen that looks just like a touch-up pen. In this way, there is nothing (such as a tray) interfering between the light and the gel on the teeth. This method is basically how dentists do it (and they get the best results in the industry), except that dentists use a higher concentration of gel and they actually apply the gel to the patient's teeth after applying a gingival protector. If the tray system worked better, dentists would be using it for their light-activated treatments, but they do not. 1. It is more effective because the gel has a 16% hydrogen peroxide concentration (the highest concentration in the market for cosmetic teeth whitening). With the tray system the highest you can safely use is 12% hydrogen peroxide. 16% in a mouth tray will cause a lot of gum irritation. 2. There is no mouth tray interfering between the light and the teeth. Even if the mouth tray is clear, it still refracts the light. 3. It's safer because the gel is applied directly to the teeth so no gel squeezes onto the gums; hence it does NOT cause gum irritation even at 16% H2O2. 4. 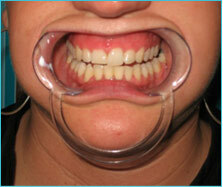 It's more comfortable because the cheek retractor keeps the customer's mouth open without any effort on their part. 5. With the tray system, the customer strains to keep smiling, which is difficult and sometimes even painful, and many people can't expose their teeth completely to the light even when they smile, so they get uneven results.